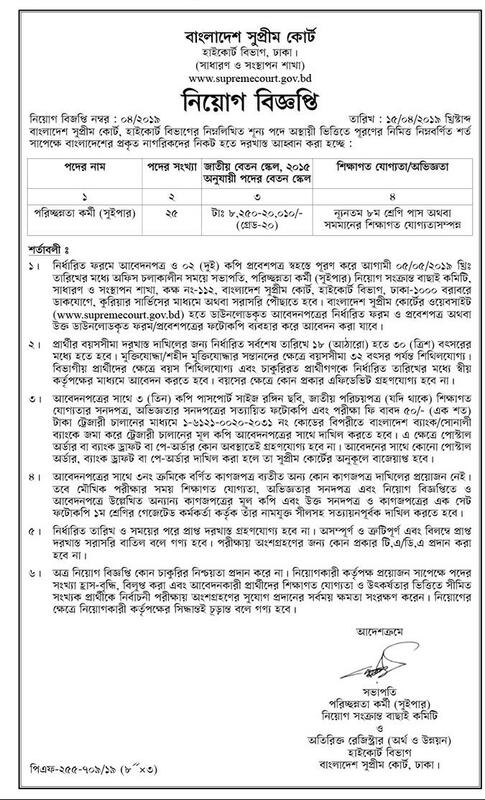 Bangladesh Supreme Court Job Circular 2019 has been published on 12th April 2019 with a various kinds of posts and good salary. The application for the circular will be available up to 30th April 2019. The circular has found from the official website of www.supremecourt.gov.bd. Applicants need to get the application form from the website and have to apply. It is a very affordable job circular for every types of peoples and there are Imam, Muajjin posts are available for the Madrasa students. Bangladesh Supreme Court Latest Job Circular 2019 has been announced for the 13 different categories job posts and many vacancy available. To apply see the circular and their conditions and read it sharply. Educational Qualification: At least JSC, Hafej, Alim, Fazil Passed applicants can apply for the posts and Maximum Honours passed applicants can apply for all positions. Applications Starts: Starts on March 2019. Applications Deadline: Application will be continued on 30th April and 5th May 2019. Total Posts: See the full circular and about Posts. Job Categories: See There on circular. To get regular such government job circular stay with our page and share our post to your timeline. You can also comment on our Facebook page at www.facebook.com/Bdresultpage or message to our Facebook page directly to contact us. Thanks for being with us. To get more information about the Bangladesh Supreme Court Job Circular 2019 contact with us on our Facebook page or comment below for further information. Personal Officer er exam kokhon hobe ???? ?